Saturday 1st It was a fine day. Willie was working at the quarry all day. In the morning I planted some Ixias that came from Mr Glass & got firewood. In the afternoon I went down to the cottage occupied by Mr Woods to put some chairs together. Mr Woods came here in the evening and we played 500. He staid the night. Sunday 2nd It was a fine day. Mr & Mrs Glass came to spend the day. In the afternoon we had some good music. Mr Glass played the harmonium, Mrs G the mandoline & Mr Woods the bassoon. He came in the afternoon but went home in the evening. Monday 3rd It was a very dull day. I was working in the flower garden weeding. In the afternoon I went down to Dunning beach to get some shell sand, came home by way of the village to get the mail. Mr Woods got the belfry top on and fixed the bell. Tuesday 4th It was a dull day. In the morning I went down to Mr Woods cottage to glue the chairs together. Found Mr Woods laid up with an attack of biliousness. Worked in the garden in the afternoon. Wednesday 5th It was a very fine day. I sowed oats in the piece of ground near the Lemon Trees and I pointed it in. In the afternoon I went down to the steamer. Carried up a bag of sand. Thursday 6th It was a fine day. Mrs C. Wyatt came to see my garden, I gave her some young plants, she staid for lunch. I took a parcel down to post for Grace. Called in at Mr Woods cottage and finished fixing up the chairs for the church. Was working in the flower garden, re-planted a Duronicum plant. Agnes came over and staid the night, Mr Woods also came for tea and staid the night, we played Five Hundred. The Roses I ordered from Lippiatt came by post this evening. Willie Dunning drove me up to our gate. Friday 7th It was raining when we got up and it rained nearly all day. It cleared up in the evening. Mr Woods remained with us and staid the night, we played 500. Miss C A. Matheson called in the afternoon for me to witness her signature. Saturday 8th It was a fine day. Wind from the E. After breakfast Mr W and I went down to the village. Stanton had come from Matakana this morning so he and Mr W. went on with the Church. I got the mail and posted some letters. When I came home I started planting the Roses I received from Lippiatt, the positions are shown on the opposite page. Sunday 9th It was a fine day, wind blowing strong from NE. Mr Mogridge a Methodist student held services in the morning & evening for the Presbyterians, I attended both services. He is a very good preacher and I enjoyed the services very much. Mrs Handby & Mr Addison were here for lunch and the latter for tea. Monday 10th It rained nearly all day. I was not able to do anything out of doors. Willie got a lot of firewood. I went down to the village in the pm to get the mail, heard down there that the Cunard steamer Lousitania had been torpedoed by the Germans a few miles off the Irish coast on her voyage from New York to Liverpool. She sank in a few minutes and over 1000 persons were drowned. I wrote a long letter to Jack. Tuesday 11th It was a very fine day. Willie was rooting out some old Peach trees in the orchard. I got a lot of tea tree from the hill and made Kerbing for the flower garden. Wednesday 12th It was a fine day tho dull. In the morning I went down to the beach and sieved some sand, and Willie who hauled some fruit down to the wharf and he brought the sand up for me. The Hui at the Pa was put off until tomorrow. I went down to the village in the afternoon, when the steamer came in, to get the mail. Thursday 13th It was a very fine day. I went down to the village in the morning to post some letters, also went to the wharf to see the steamer off. Got some sand and John Greenwood gave me a ride up to our gate. Left his wagon outside and put his horses into our place so as to be ready for the Hui this afternoon. Tom Jennings came for some flower for Mrs Harris to decorate the dinner tables at the Pa for the feast this afternoon. All of us went over to the Pa this afternoon to witness the unveiling of the monuments erected to the memory of Parata Brown and to the old chief Kiri. There was a large party of people present, also many Maoris. Revd Tui conducted the religious service and addressed the people present. I also gave an address. Afterwards there was a grand dinner in a large marquee. In the evening there was a dance in this Hall, I went down to get the mail and attend the Library. I did not stop at the dance long. Friday 14th It was a fine day. Willie went to work at the quarry to day. I was working in the garden in the morning. I planted the three remaining Roses that came from Lippiatts, and cut the grass on the path. In the afternoon I went down to meet the steamer and get the mail, carried some sand. Saturday 15th It was a very fine day, but cold as the wind is from the S. After breakfast I went down to the village to post the Weekly News to the boys, carried up a bag of sand, after I came home I got firewood. In the afternoon I got mangolds from the farm orchard, sowed seeds of Pansy in a box, planted out some dwarf Nasturtiums near the summer house, and cut grass on the path. Sunday 16th It was a very fine day. Willie and grace went to spend the day at the Addisons. Agnes & Eileen came up from Bible Class and I gave them some dinner. In the afternoon I went down to the Hall. The new Methodist minister Revd Southern conducted service and made a good impression. Afterwards Mr Woods & I walked up to Mr Jas Greenwoods and had tea there and spent the evening. [sic] Monday 17th It was a very fine day. In the morning I planted out several Nasturtiums, Wallflowers, Antirrhinums & 1 Marigold & 1 pink & white Pelargonium. In the afternoon I got firewood and went down to the Steamer to get the mail. Carried up some sand. Tuesday 18th It was fine in the morning. After breakfast I went down to the wharf. Carried up some sand, after I came home I planted a Wallflower, an Antirrhinum & a Tropaeolum near the front gate. It came in to rain and I had to knock off and it set in for a wet day. Willie went to work but had to knock off after the dinner hour. Wednesday 19th As the ground was so wet Willie stopped at home. He packed fruit and Eggs and hauled them down to the wharf in the afternoon and hauled up a sack of Maize. In the morning I was writing, in the afternoon I went down to the village. Heard the sad news of Alan Wallace’s death in an English Hospital of wounds received in the Dardanelles. It was a great shock to us all as we loved & esteemed him very much. It will be a great blow to his family, as they were so justly proud of him. Thursday 20th It was a fine day. I was working in the flower garden in the morning. I planted out some Wallflowers Antirrhinums & 1 dark blue Forgetmenot. Miss C. A. Matheson came & asked me to go down to witness the signatures of Roderick & hers to some legal documents, so I went down in the afternoon & found Roderick in a very weak state and near his last end. Also went down to Peter Louis place on the beach to fix up some papers for his housekeeper. In the evening I went down for the mail and attended the Library. There was a meeting of the Hall Committee afterwards. It was decided to fence the Hall site, line the Porch & erect a Boiler House & procure a boiler. Friday 21st It was a dull day. A poll of the Ratepayers was taken in the Hall re striking a bridge rate of ¼ d in the £ for re-instating the Bridges in the County in permanent material. I acted as Deputy Returning Officer. I had a very quiet day only 26 votes were recorded, 18 for the proposal and 8 against. Saturday 22nd A dull day and late in the afternoon settled into a steady rain. It was a busy day with me. After breakfast I went down to the village to post some letters, after I came back I commenced to cut firewood when the axe handle broke and I had to go down to the village to get an axe handle, put it in and cut enough wood for to day and tomorrow. Then I had my lunch and went down to the Hall to a meeting of the church committee, Revd Macdonald being present and occupied the chair, a lot of unimportant business was done. It continued to rain all night. Sunday 23rd Everything was very wet this morning, but it turned out a beautiful day, and the ground & the roads dried up a good bit by the afternoon. 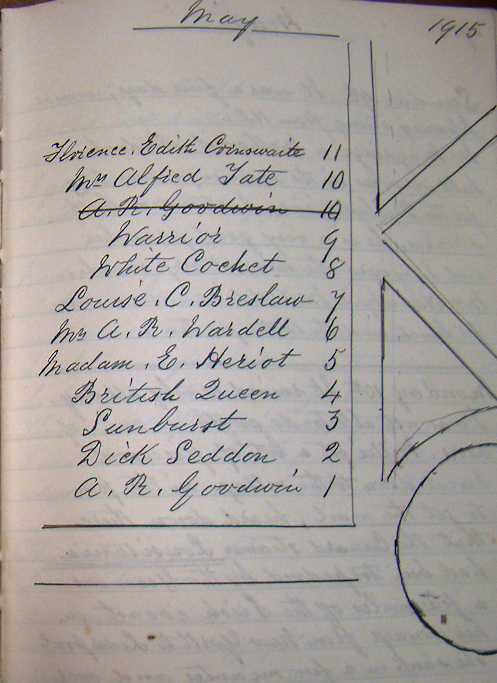 Revd R.A. Macdonald held service in the Hall in the afternoon, there was a fair congregation, the Collection 12/4. After church Joe & Minnie & Mr Woods came up here for tea and we spent a very pleasant evening in conversation. Monday 24th It was a wet day. I got a lot of firewood. Willie staid at home and did odd jobs. Tuesday 25th Showery in the morning but finer in the afternoon. In the morning I went down to the village to get the mail. Willie took the horse down to the wharf, he hauled up the Harmonium for the Church and also fruit cases. At 2 pm Roderick Matheson was buried in the Cemetery, he died last Saturday. Mr McPherson conducted the service at the grave. Wednesday 26th Willie has got influenza and did not go to work at the quarry. I went down to Dunnings beach and carried home some large stones for the garden edging. Went down to the wharf when the steamer came in to get the mail. Mr Woods came up for tea and we played at Five Hundred in the evening. Thursday 27th Several showers during the day. In the morning I went down to Dunnings beach and carried up large stones. In the evening I went down for the mail and attended the Library. Friday 28th It was a showery day. In the evening Mr Jas Greenwood and I met some of the members of the Tennis club to arrange about a fence between the Church and the Tennis Court. Saturday 29th It was a very showery day. Mrs Kempt was buried in the Cemetery in the afternoon, there was a good attendance considering the weather. Revd Yarnall officiated at the grave. Sunday 30th It was a very showery day. There was no service so none of us went out anywhere. Monday 31st It was a very fine day. In the morning I walked over to Ti Point. I called at Harolds and had lunch there. Arthur Wilson was ploughing for him. I afterwards went down to Joes, Minnie was fishing down at the wharf, but as she had no luck, she came home and showed me her garden and gave me afternoon tea. On my way home I called down at the village to get the mail, Mr Woods came back from Auckland by the “Kawau” and he gave me two newspapers.